Manuals are set standards created for business and organizations that help in creation of consistency and avoidance of any possible pitfall that may occur. Organizations consist of different departments and each department have their own templates. 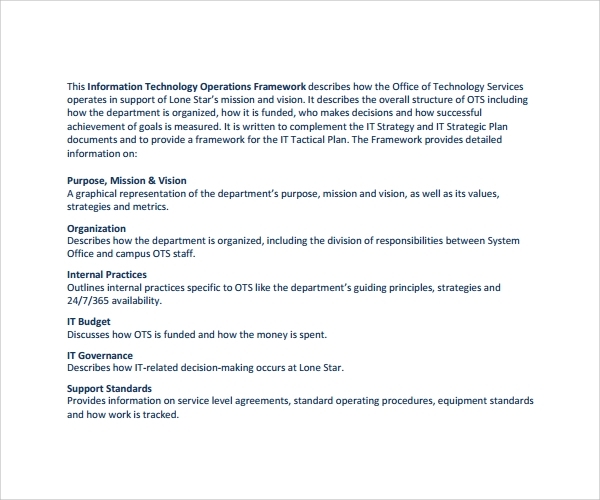 The organization’s talent management team mandates the IT department to create quality IT manual templates that offer guidance to the existing worker or new ones. 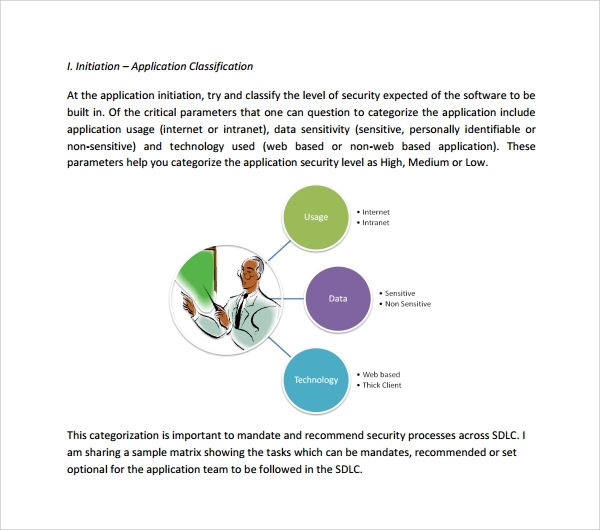 The Procedural Manual Template are in different types, applied in different aspects of the IT field. IT operations manual is a step by step written booklet plan where employees use as reference in finding out about something. IT Operations are basically activities involved in IT field. They include using charts, backups, inventory management, matrices for server monitoring, task scheduling, working with tables and databases, and reports. The main importance of an IT procedures Manual template is it help mangers in decision making and management. 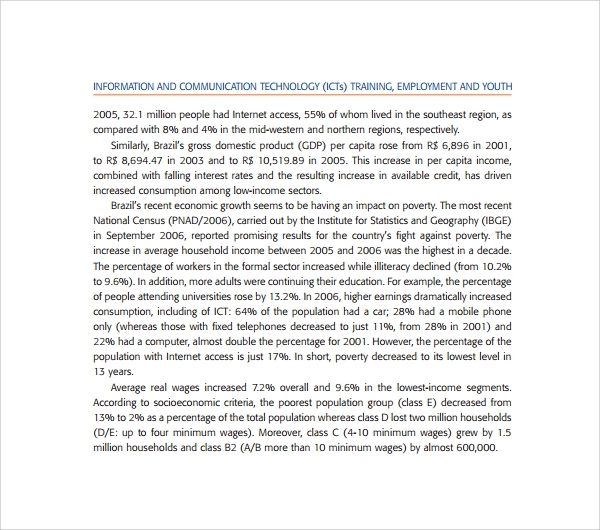 It ensures staffs are aware of their obligations in utilizing information technology. Involves selection, use, safety where an employee gets a clear understanding on what is expected and allowed. Data security and protection are a priority hence security management and compliance is warrant. With rising number of security alerts, secure measures are to be in place in order to protect the data networks. IT security manual template contains forms and checklists for securing web servers, operating systems, securing network devices, databases. 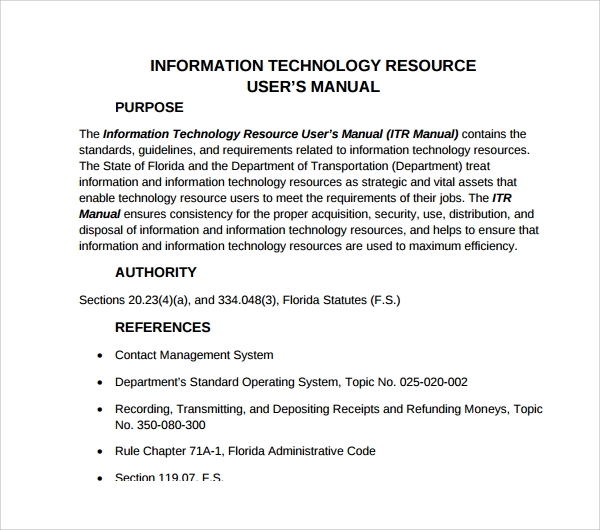 IT user manual template contains information and guidelines needed in setting up and use of IT products. The information describes how-to- do-something with the product. Procedures and context in completing the procedures are written geared towards a user of the product. IT user manual supports both functional and work flow approach to tasks. IT Training manual provide a way to communicate instructions to employees on how to do specific and important functions of their jobs. They also help trainers to know what and how to go about in training new hires. The manual should contain instructional objectives, information on processes and procures required to be followed by employees. The IT support manual template is most similar to the user manual but it is geared towards the third party- a customer. 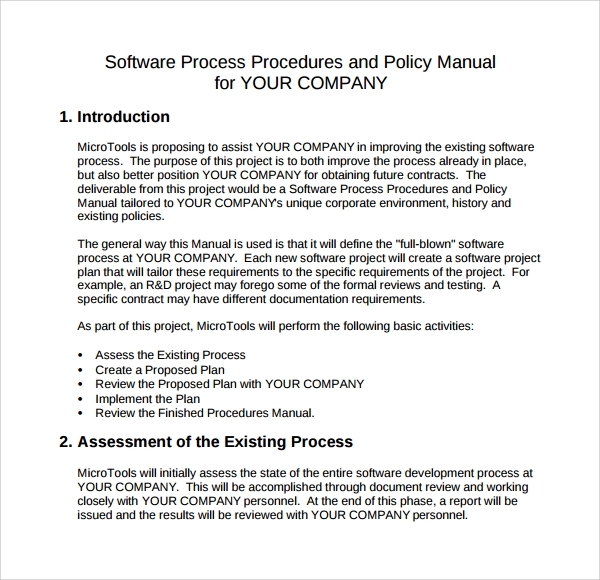 The manual provides information in how to do set up and use your IT product. All hardware and software documentation are listed in easy steps to follow through in using your product. Also contains contact information from the product sellers or manufacturers. 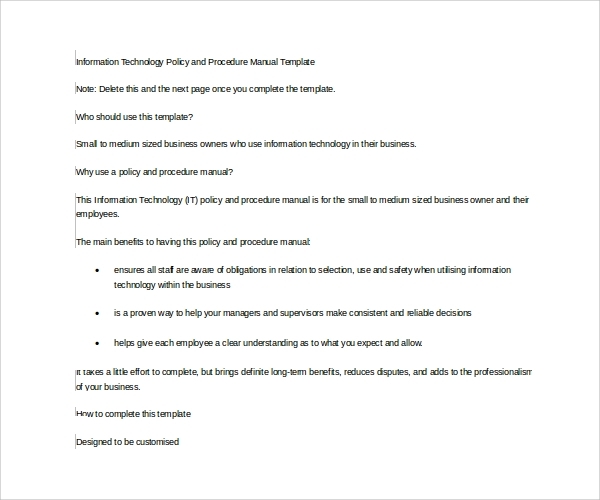 What are the Purpose of IT Manual Templates? IT operations manual will help in running the IT environment smoothly. The IT manuals, Security Manual Template will create a standard for your business and you will have better outlined employees, and your business and IT department will be more valuable. In creating an IT manual, Business Manual Template your target should be to make a useful manual that is inclusive of all important aspects. It should include a contact list for all IT employees, general emergency numbers; checklists on IT functions including; steps in server monitoring or machine update and maintenance; how to guides; policies to keep the IT team on the same page. Ensure all information in the manuals is readable, clear, easy to understand and direct to the point. In creating IT manuals try and consult the intended users. Ensure the manuals are user friendly. Technology changes as frequent as day and night hence we have ensured our IT manuals and templates always be up-to- date with the latest working technologies and procedures. Our templates are editable and are compatible with both higher and lower versions. You can also get customizable template as per your requirements.